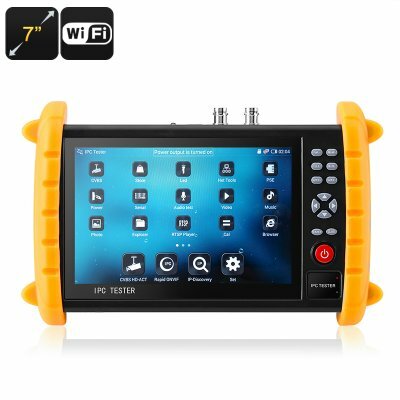 Successfully Added Surveillance Camera Tester - 7 Inch Display, ONVIF, Wi-Fi, Cable Tester, IP Scan, Ping Test, Port Flashing to your Shopping Cart. With its 7-inch touch screen display, this IP camera test kit is the perfect way to setup, test, and adjust your CCTV, analog, IP and wireless camera security systems. This test system has a 12Volt 2 Amp output so you can directly power your camera and see the live feed on the 7-inch screen. ONVIF compatibility brings support for over 30 different IP cameras such as Hikvision, Dahua, Honeywell, and Samsung. There is also support for many PTZ cameras, IP scan and camera recognition as well as ping test, port flashing and cable testing functions. All this will make it easy to precisely setup your camera system and adjust the angles to cover your desired locations. With RS484 input you can even zoom pan and tilt you PTZ cameras ensuring the full range of motion meets your requirements. This camera tester brings technicians a wide range of functions to simplify IP camera and CCTV installation and maintenance without having to make content trips to the control room. The units 7 inch IPS display has a 1280 x 800 resolution that is bright enough to see even when working in direct sunlight. With strong secure lanyard connections and securing straps, you can suspend the IP camera testing kit when working in high or hard to access locations. A built-in 5000mAh battery brings working times of up to 10 hours and the kit and charging lead comes in a protective carry case. This 7 Inch IPC 9600 Camera Tester comes with 12 months warranty, brought to you by the leader in electronic devices as well as wholesale IP cameras and security testing gadgets..